If you have back pain that is not getting better and think your only option for relief is surgery you need to read this. To qualify for spinal surgery there are specific criteria that the insurance companies use to ensure that surgery is only performed when necessary. So if you have a back problem you can’t just run out and get surgery, or for that matter surgeons can’t do surgery on every back patient. The criteria need to be met first. Insurance companies set standards and some of the criteria are obvious; if you have any of these you qualify for immediate surgery. 2. Advanced scoliosis curves over 40 degrees. There are 2 types of spinal surgeries. One is the medical emergency such as those listed above; this category constitutes a very small percent of all spinal surgeries. The second is what we call the elective surgery. The elective surgeries account for almost all the spinal surgeries performed in the United States. The elective surgeries are the types of surgeries we have the ability to prevent with our treatment; these are the chronic disc back pain patients. The chronic disc related back problems that we save from surgery are the following: herniated disc, bulging disc, sciatica, degenerated disc, stenosis and sciatica. Most insurance companies have very strict criteria to qualify for elective surgery. If you meet the insurance company’s criteria you become a candidate for surgery. This criterion is what we use to identify who we have saved from surgery. The criteria are based on the amount of disability that a patient has as a result of his or her pains. The disability is determined by a score that rates the effect the pain has on your ability perform everyday activities. In essence the score is based on your ability to live your life. I know it sounds a little confusing but it’s all based on a score from the ODI, the oswestry disability index. ODI is a series of 10 questions that has 6 answers; each answer is worth a different score. All the answers are added up to give you a score of 0-100. A score of zero means no pain and you are able to live your life normally. A score of 100 is the worst possible pain; it is the type of pain that causes serious limitations on the quality of your life and ability to live your life. A score of 80% and above is considered an emergency and immediately qualifies for a surgery. I reference the ODI score in all our case reports because it is the medical gold standard for identifying how serious the problem, but it also can be used to identify how much you have improved as a result of treatment. So it’s a way of keeping score as to how bad the patient’s conditions are, as well as how we are doing as a team to fix our patients problems. We take a score when you start your care, and then as you progress through care we will take more scores. We will compare your scores to identify progress or lack thereof. The ability to treat your problem will be reflective in the change in score. The quality of care for your problem is also reflective in the score changes. We call this outcome. If you have bad pain when you started treatment and the pain is dramatically affecting your life, your score might be a 62. After 10 treatments we will take another score and you may be at a 42. When the number gets smaller that means you are getting better. That’s how we know you are improving, and our treatments are effective for your condition. Understanding how the insurance companies use the ODI as an indicator to identify if you need surgery will give you some insight into how I can make the claim that we save patients form surgery. The following criteria are used by a major insurance company to identify if a patient qualifies for spinal fusion surgery. Just remember fusion is the most complicated surgery for your spine, and your future for that matter (it has the most secondary consequences of all spinal surgeries). Fusion surgery is also the most expensive on average it costs $100,000 and can cost at times up to $250,000 (quarter of a million dollars). For example, if you have an ODI score of 56% when you start therapy and you get 2 months of therapy (or 24 treatments) but your score only drops to a 42%, you will become a candidate for surgery. Your score is getting better but it is still above the 40%; the magic number of the insurance companies is when your score is above a 40% after you have undergone therapy. So we know if you are above a 40% after therapy you are a serious candidate for surgery. Knowing that if you have the above criteria you are a candidate for surgery, and you come to our clinic and get better, we have saved you from surgery. To summarize the whole article it is very simple. 41 year old male construction worker entered our clinic complaining of severe back pain and leg pain. He has been experiencing the pain for 3 years and recently the pain started getting worse. His pain began after lifting a heavy object at work. The pain when he first injured his back was not too bad but slowly the pain started increasing. By the time he entered our clinic his pain was an 8 on average. On a bad day his pain level was up to a 10 (10 being the worst). He had seen his primary doctor and was taking an occasional medication, but he stated that the meds did not really help and he did not want to take them if they weren't going to solve the problem. He went for physical therapy at a local traditional Physical Therapy clinic but again his pain did not go away. He had seen our Television show and thought, "What do I have to lose?" He knew he did not want surgery, so he thought he would give Illinois Back Institute a try before seeing a surgeon. When he started with therapy his pain was an 8 and his ODI (Oswestry Disability Index) was a 56. After his 24th visit the pain in his back was at a 0 and his leg pain decreased to a 0. He had some complaints of stiffness in his back but the pain was gone. His ODI was scored at a 4. His posture and strength continued to improve, and he was dismissed from care after 26 visits strong, stable, and pain free. When the patient came in to see us he had a herniated disc verified by his MRI, so we knew he had a disc problem. He had been through a course of care for physical therapy, and his ODI was above 40 (it was 56). He was a classic case for surgery. We treated him without drugs or surgery and he got better. We saved him from surgery. Click the image to see another patient saved from neck and back surgery. His ODI for his neck was a 42 and his lower back was a 52 before he came in. 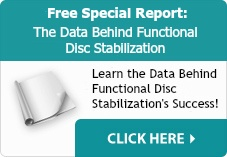 Our treatment is one of kind because it’s the only treatment available that specifically treats the disc. The surgical candidates that have an ODI above 40 need treatment on their disc, we perform the treatments to the disc and they get better.